After the machine-list file is created, you are ready to start the batch processing queues. They must be started on all machines that will perform batch processing. A message appears in the shell indicating that the script was successful. The tbprocess program is installed with the Toon Boom Harmony system. It monitors the Vectorize and Render batch processing queues for work to be done and runs the appropriate programs to vectorize or render the images. If you reboot the machine after installing the Toon Boom Harmony, the tbprocess program starts automatically on each Toon Boom Harmony client and server. During a normal installation, Harmony places a file called S98USAnimation_queues in the /etc/rc2.d/ folder. This file controls the launching of the tbprocess program when you reboot. S97USAnimation_queues,S96USAnimation_queues, S95USAnimation_queues and so on. If you do not see this file in the /etc/rc2.d/ folder, you need to reinstall the links for Harmony. However, if you do not reboot after you install the Toon Boom Harmony system, or someone stops the tbprocess program on a specific machine, you must start the tbprocess program on each machine assigned to the batch processing schedule before you can batch process the items in the Vectorize or Render queues. Open a command prompt and log in as the root user on the machine on which you want to start the Process program. Press Return to make sure there are no tbprocess programs already running. A PID (Process ID) number appears when the tbpprocess starts. To stop the Process program on a machine, type /etc/init.d/USAnimation_queues stop and press Return. To view the batch processing schedule status for all machines, type Status and press Return. The batch processing schedule appears. 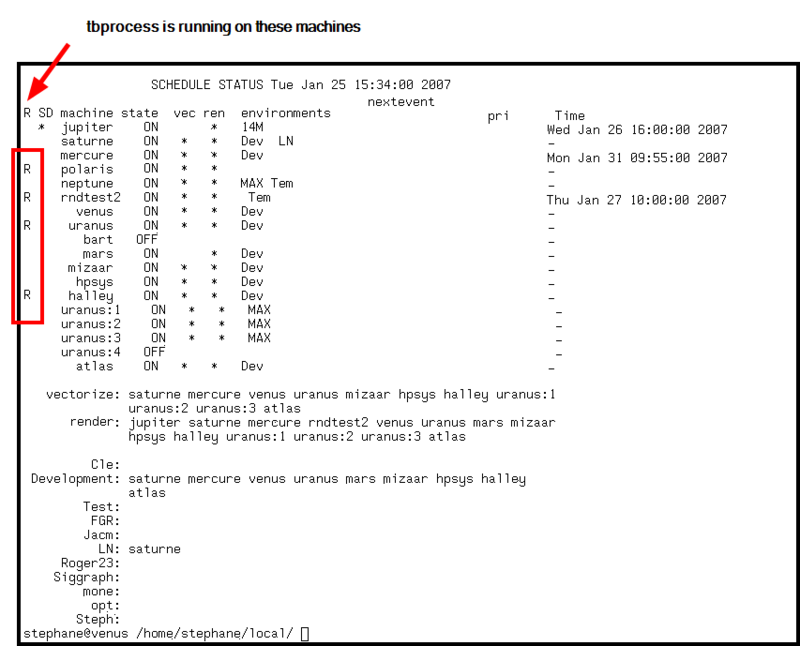 The column on the left displays an R for each machine on which you launched the tbprocess program.